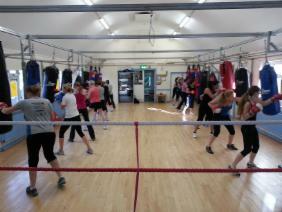 Boxing for Fitness is one of the fastest growing activities for women, nationally and globally. Boxing for Fitness is not only one of the best ways to tone up and burn fat but it is also a cathartic stress reliever which can aid the release of pent up tension and emotions which we all carry around day to day. Our Women's Fitness classes are purely geared towards women who enjoy a great body workout to burn off calories and improve stamina without having to go in the Ring. Boxing training is also one of the few static cardio workouts that is safe for those with joint problems often associated with weight-gain. Our Women's training session consists of Bag/Pad work, Skipping, Floor Exercises (Legs, Bums and Tums) with Stretching Exercises to finish off. Competitive Boxing requires commitment - those that wish to Box Competitively can discuss their requirement with one of the Instructors who will advise them on the process.